The Zenbook 3 is the culmination of several years of development of the highly successful Zenbook series, and we have to say that it’s a piece of art. When you pick this Ultrabook up, you’ll be simply amazed at how thin and light Asus has managed to create a laptop – it actually feels lighter than a standard print magazine. It’s a sign that we’ve entered a new era of ultra-portable computing, and we’re enamoured by it in nearly every way. Measuring a mere 11.9mm in depth, Asus apparently had to invent the world’s thinnest screen hinge to make this a reality, at just 3mm deep. Despite its small 12.5-inch 1920 x 1080 screen, Asus has managed to fit a full-sized keyboard into this laptop – if the screen were any smaller it would be simply impossible. And yet it feels absolutely beautiful to use despite the short key-travel, as does the super accurate touchpad. We can’t understate how wonderful the touchpad is – it’s totally spot on with accuracy, and the invisible buttons are just in the right place. Asus even managed to fit four speakers into such a tiny unit, thanks to help from Harmon Kardon, yet to be honest they’re still not a huge increase in quality from the usual average sound from a laptop. 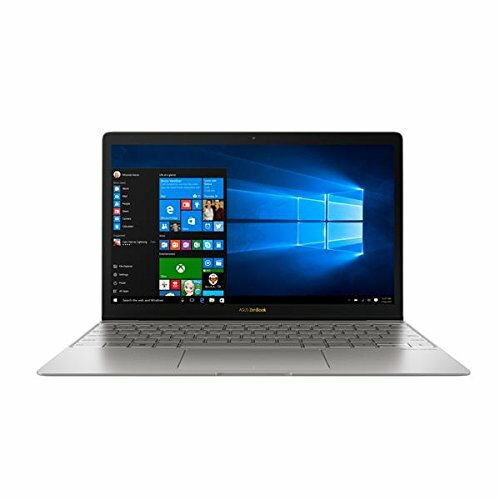 The entire unit is housed in an all-metal unibody-design, which means Asus has carved the entire top and bottom halves of the chassis from a single piece of metal, which also happens to be made from aerospace grade alloy, making it 50% stronger than the usual metal used in most other Ultrabooks. Golden edge highlights complement the beautifully smooth metallic exterior, with a golden Asus logo dead center of the exterior of the top screen. Matching this is the golden backlight on the keyboard, with Asus sticking with a single color rather than the rave-like lighting found elsewhere, reinforcing that this Ultrabook is all class. Weighing a mere 910 grams, Asus has used Corning Gorilla 4, which is just 0.4mm. It’s an IPS display with a huge 178 degree viewing angle, we were also impressed by just how rich the colors and contrast are of this screen. Asus claims a 1000:1 contrast ration, and we believe them. The screen is surrounded by a tiny 7.6mm bezel, which helps make the display look bigger without making the entire unit look too large. Sadly the small size means battery life suffers, measuring just 168 minutes in our PCMark 8 battery test. We think this thing will probably struggle to live up to its all-day claims. The key to this machines ultra-tiny size is Intel’s new range of processors. Available with either an i7 7500U (twin cores, Hyper-Threaded, 2.7GHz base speed, 3.5GHz Turbo speed, 25W TDP) or the i5 7200U Processor (twin-core, HyperThreaded, 2.5GHz base speed, 3.1GHz Turbo Speed, 15W TDP), the low power usage on these chips means Asus didn’t need to worry about exorbitant cooling solutions. Our review sample came packing the higher end chip, hence the higher price. Obviously there’s no discrete GPU at this weight class, but 8GB of LPDDR3 2133MHz (upgradeable to 16GB) memory helps keep the pace up. There are also two options for the drive – a 512GB SATA 3 drive, or a 512GB M.2 PCIe Gen 3 SSD (our sample had the M.2 drive); while the latter offers superior speed, both offer a decent amount of space for such a small Ultrabook. This hardware combination powered the Zenbook 3 UX390 to a PCMark 8 Score of 3809 – nothing mind-blowing, but enough to run several applications without noticing severe slow down. If there is one annoyance, it’s something Mac owners will be used to – in terms of connectivity there aren’t a lot of options. In fact, just a single USB 3.1 Type-C port is included, which doubles as the power port. There’s also a 3.5mm stereo minijack for audio but that’s it. Asus is gracious enough to include a Type-C dongle that adds HDMI, USB 3.0 Type-A and another Type-C connection. There’s even a carry pouch to keep it scratch free. This Ultrabook might not be cheap, but it is arguably the sexiest on the market. 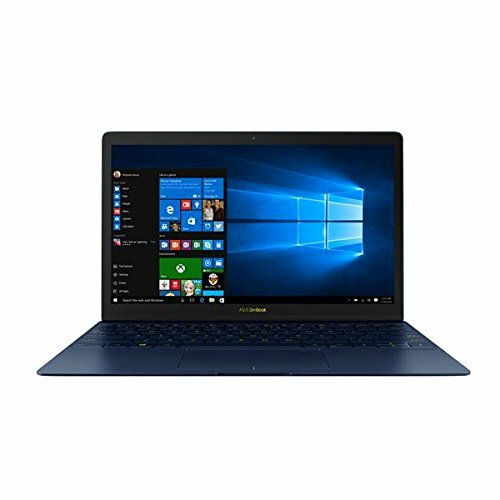 The unbelievably low weight and ultra slick design helps it stand out from the pack, and is the best Zenbook Asus has ever made, which is saying something. Just be prepared to add the cost of a USB 3.0 Type-C into the buying equation. 12.5-inch 1920 x 1080 IPS screen • 910 grams weight • 16GB LPDDR3 2133MHz memory • 512GB SATA 3 or 512GB PCIe Gen 3 SSD • 1 x USB 3.0 Type-C output. Crafted from premium aerospace-grade aluminum to create a body that is less than half an inch thin weighs only 2 lbs.